Views from the loch. : Here we go again! Photo 01 Allan's two cracking Trout! see Good Morning below. Our season is only weeks old and already we see actions from anglers that quite frankly are completely out of order! It is clear that in both cases there was no ill intent on the part of the anglers, it simply boiled down to having little consideration for others. The first case concerned two anglers and two vans on the Cafe Green who camped overnight and duly started up a petrol generator which run from around 09.30 till 1.00am approximately. Now there are two issues here, the first is that there are signs erected on the green saying that no vehicular camping is permitted. The second issue was that of noise up until the early hours of the morning. Clearly, the noise was an issue as the generator was stationed as far away from the vans as their long extension lead would allow. The occupants of the van may have been accustomed to the generator sound but the occupants of the Tibbie caravan were not! They had come for peace and quiet only to be subjected to the thrum of the generators engine up until the early hours. It’s not good enough, by all means, enjoy yourselves but think of others! As I said there was no obvious malice and this was also the case with the second incident where a ghetto blaster type machine sent a stream of music over to the Tibbie on what was a still Thursday evening. Again a case of unthinking behaviour. Anglers need to consider how their actions affect other people. We are clearly going to have to crack down on this type of behaviour, we must be able to get along with the local residents so please let’s have a more enlightened outlook with regard to your fishing. And in case you can’t read the sign it says No overnight vehicular camping! Allan Walker one of our members from Hawick was in touch very early today telling of a short but absolutely super session at the bottom of the loch. When he was a young lad he used to nip down to the river with a few strands of yesterday’s spaghetti to see if he could catch his breakfast and when he did his mum would cook them and all ate heartily. He thought it would be fun to try the procedure 50 years on and below is how it went. 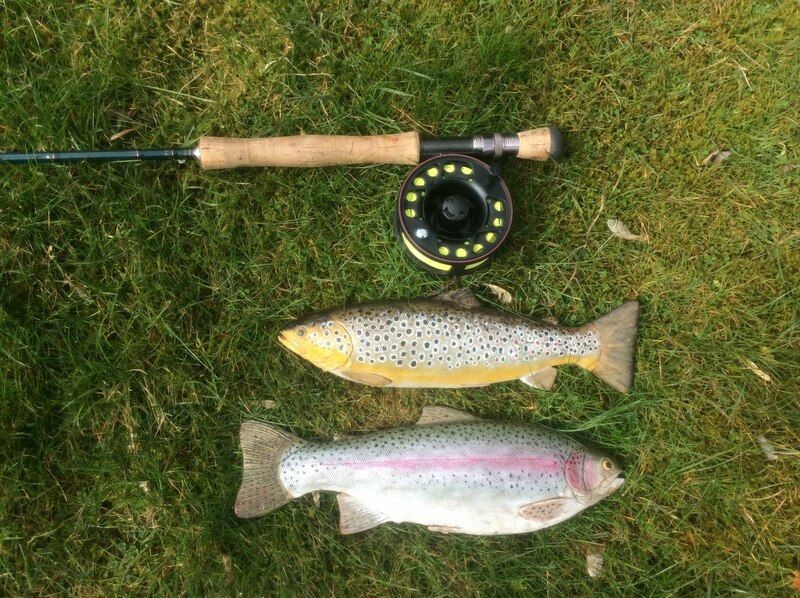 Conditions, of course, were poor, being very cold but as it turned out great conditions for catching feeding Trout. Using a slow sink line and a strand of (boiled) spaghetti impaled on a size 14 he worked the bottom end near Kirksteadnand it was only when the bait was nearing the bottom the line gently pulled and it was fish on and a golden-bellied Brownie came to the net! Half an hour on and the above process was repeated but this time it was a beautifully coloured Rainbow Trout! Turned out to be a really good morning indeed! Just goes to show that the early bird gets the worm or fish in this case! Well the supposed meeting between us and the warden or those who appointed him has not taken place! We are the most relevant group of people who could assist in the aim of the scheme. We had agreed to meet on any Saturday any time and any place! We do not have contact details for him, we do not know the hours he is working but we do know his name courtesy of the local rag! This initiative was meant to herald a new start but so far it has proved to be little more than an embarrassment to all concerned with the venture! It’s turning out to be a complete shambles! It’s like the whole escapade had been organised by a Tory MSP or a Tory MP so farcical is the situation. It does not bode well for the future when everyone is at crossed purposes, a coordinated approach is required. I will let you know when they have contacted us but don’t expect to read anything in a hurry! We have a good few members that have given us much in the way of time and angling equipment over the year’s just look back on these news pages. Well, the one we have come to refer to as Santa Claus made a delivery this week and boy was it a bumper pressie! We have been gifted a 44lbs thrust Shakespeare electric outboard engine and it is in pristine condition! It is so good that a few of us think it may be unused! With it came a heavy duty battery charger and a litre of engine oil obviously not for use in the electric engine. We are indebted to the angler as we are to all the others who have selflessly given. It is the highlights as above that effectively outweigh the negatives and make this club such a great one! You won’t find a Mr Xxxxx or the local angling bully here just good honest right thinking anglers! Perfect! We would like to make these engines available to club members so watch this space! If any of you have experience of solar battery chargers please get in touch.